We already knew that patch 2.2 was titled „Guardians“ and that the name stands for the new fighter class of ships that we will be able to launch from our own main vessels. These ships will be very small and agile with no FSD drives. Those who tried Elite: Arena or CQC will notice that two of these look very familiar. Frontier again confirmed that the first two type of fighters will actually be the Imperial Fighter and the F63 Condor, both of which are currently in-game. The third one, called the Taipan, will be the toughest of the three with fast shield recharge, but also the slowest with the worst manoeuvrability. The Condor will be the fastest with light armour and medium manoeuvrability, while the Imperial Fighter stands for the best manoeuvrable fighter but also the most fragile one. The idea behind these ships is that they deal a great punch while being very fragile. So basically, glass cannons in space that will give less combat oriented ships a way to defend themselves against attackers. As with passengers, these new fighter bays can be purchased in ship outfitting departments. Having them on board will enable players to craft them while in space using ammunition (similar to current crafting mechanics). Players can choose whether to fly them on their own or let the AI do the fighting for them. If the AI is in charge, there will be several options to choose from like “follow” or “stay”. The controls will be slightly different than in CQC since those are mostly arcade-ish and designed with fast paced combat in mind. Unfortunately, not every ship can have fighters on board. So far only the Type-9, Anaconda, Beluga Liner, Federal Gunship, Federal Corvette, Keelback and the Imperial Cutter will be able to fit SLFs. As in CQC, they can be fitted in different ways with 3-4 various loadouts and some utilities like chaff, point defence and heat launchers. 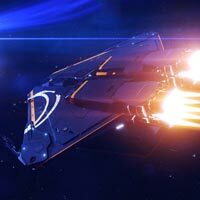 Players will be able to take up to 16 fighters on their ship. 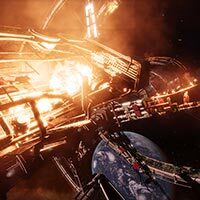 With the new AI system for the ship launched fighters, Frontier is implementing a hireable NPC crew as well. These pilots will be able to fly either your fighters or your own ship if you chose to fly them yourself. These crewmen can be hired from the Crew lounge inside the stations, and each player can hire up to 3 NPC pilots. However, only one of them can come with you on board. Now, I know what you’re thinking… “There’s no way I’m letting some random dude fly my 800mil ship!” Well… it looks like Frontier thought of that as well. 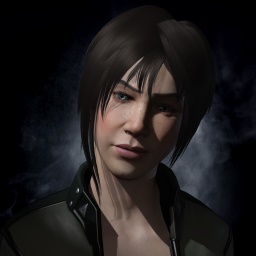 All NPC pilots will come with a background and a status of their own – meaning, players will be able to hire ranked pilots and level them up (depending on how much they pewpew stuff with you). And you thought getting yourself to Elite was a chore? Wait until your crew starts to nag about rank promotion! While on board, players will be able to issue specific commands to these pilots. So far, they are five of them: Defensive, Aggressive, Hold Fire, Stay Put, Focus, and it will be possible to hot-swap positions between the ship and the fighter. Below, you can find the roundup of all the videos shown today.